SKIN cancer symptoms are usually distinguishable and one of the most recognised signs is a change in a mole. But another indicator of this type of cancer is a spot or sore. You should see your doctor if you notice these seven changes. Skin cancer symptoms are usually associated with a change in a mole on the skin. This is an indicator of melanoma, a more serious form of of skin cancer that grows from pigment cells. But with non melanoma skin cancer (skin cancer that occurs in the skin) a spot or sore can be one of the first signs. You should have a spot checked if you are concerned about it. This could be because the spot is new, doesn’t go away or looks unusual. Cancer Research UK outlines seven changes in a spot to look out for. While spots and sores are common, the charity says one of the signs is if a spot doesn’t heal within four weeks. Five other signs which mean you need to get your spot checked is if it hurts, it’s itchy, it’s crusty, it scabs over, or it bleeds for more than four weeks. Finally, the colour of the spot could be red or dark, but the charity advises this isn’t always the case. The earlier a skin cancer is found, the easier it is to treat. But how can you prevent skin cancer in the first place? A sunscreen with an SPF 15 or higher is one of The Skin Cancer Foundation’s recommendations for sun protection. Seeking the shade is also advised, but what hours in the day should you be particularly wary of? While seeking shade during sunlight hours can slash your risk of skin cancer, the organisation states between 10am and 4pm is most important. Other skin cancer prevention methods include avoiding tanning and UV tanning beds, covering up with clothing, including a broad-brimmed hat and UV blocking sunglasses, applying two tablespoons of sunscreen to your entire body 30 minutes before going outside, and examining your skin head-to-toe ever month. Mr Rowan Pritchard Jones, a consultant surgeon at Whiston Hospital, UK, recommends taking the ABCDE test to check whether you have skin cancer, if you’re worried you might be developing the condition. 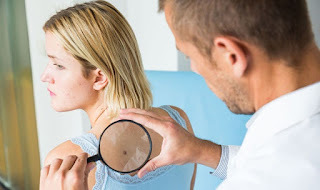 “Skin cancer is one of the major cancer killers in the UK, but if it is caught early enough then, as with all cancers, patients can have a good [chance of recovery],” he said. The recommended ABCDE test is an “easy rule to remember when checking your skin”. It should be applied to any marks on the skin that you are worried about. If a mole or freckle fits the description given by the test, such as looking “uneven” or “misshapen”, it may be a sign of skin cancer. The test is also recommended by the NHS on its website. Rowan recommends checking whether the mole looks “uneven” or “misshapen”. You should check whether the border of the mole is “blurred”. What colour is it? Rowan says you should check whether it is of “a mix of shades” or has “darkened” since you last looked. If your mole or freckle is bigger than six millimetres across it could be a sign of skin cancer. Rowan adds you should check if the mole has “changed in shape” or “become raised above the skin’s surface”. “You should always also look out for itching, bleeding and crusting and contact your GP straight away if you spot these symptoms, who will usually refer you to a skin specialist,” adds Roger. UV exposure is the main preventable cause of skin cancer, and wearing sunscreen is one of the best ways of staying safe in the sun.